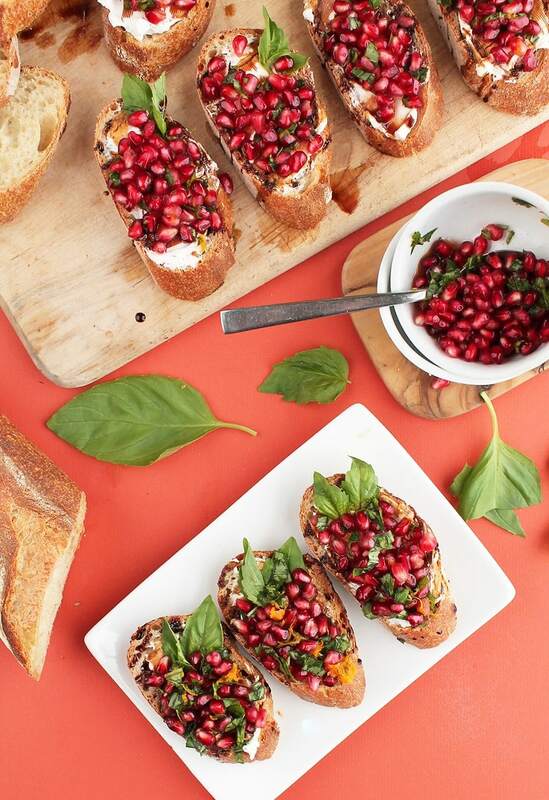 This Pomegranate Basil Vegan Crostini with cream cheese is simple to make for the perfect Christmas party appetizer to impress all your friends. You’re looking at the next big thing for your upcoming holiday party. 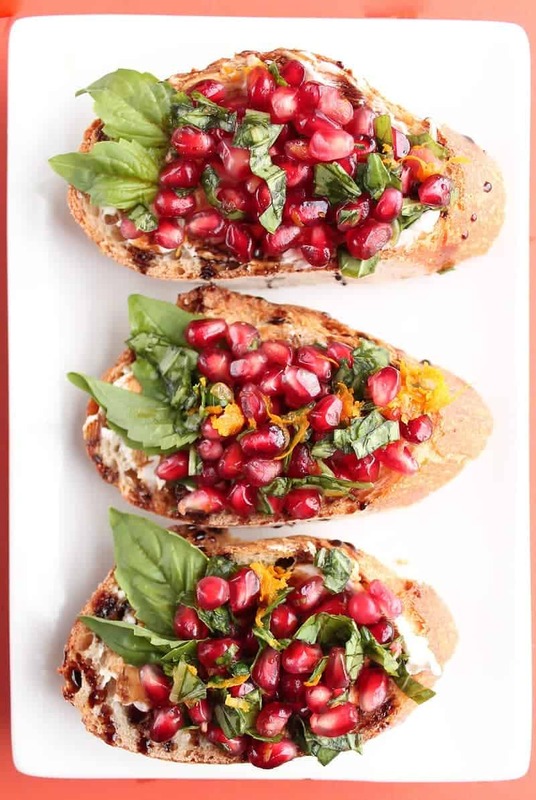 That’s right, this Pomegranate Basil Vegan Crostini is certain to be a hit this holiday season among friends and family. So grab your party hats and let’s talk Christmas! Ever since Thanksgiving weekend, my home has been filled with the glorious spirit of Christmas. The fragrant smell of sweet cookies have been wafting through my kitchen, decorations are finding their way onto shelves and tabletops, and my kids are humming the simple tunes of “Jingle Bells” and “12 Days of Christmas” under their breath. Yes, Christmas is in the air. Last night we partook in one of my favorite traditions: decorating the Christmas tree. If you knew me at all pre-kids, you’d know that I used to be a bit of a grinch about Christmas. My, have times changed. As I’ve said before, my kids have brought magic back into holidays in a way I haven’t experienced since I was a kid myself. They oohed and aahed over the ornaments as we pulled them out of their boxes, each one holding a piece of memories from previous Christmases. They held their breath when we put the start on top of the tree and squealed in delight when the lights lite up the room. 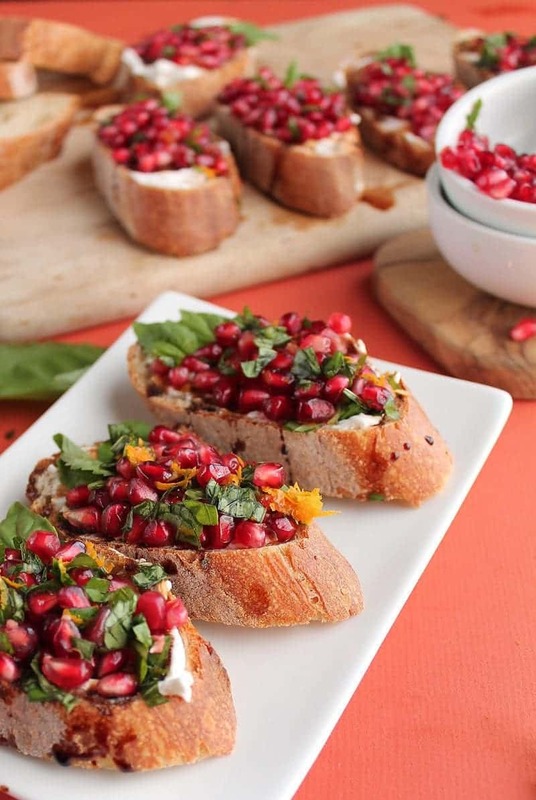 And speaking of magic, these Pomegranate Basil Vegan Crostini has a little bit of Christmas magic as well. 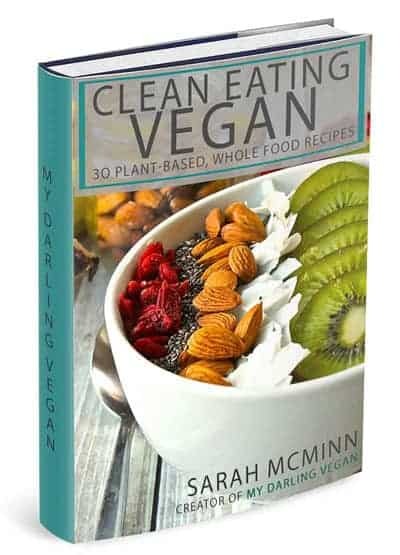 Highlighting nature’s natural vibrant reds and greens with seasonal fruits and herbs and sqeezing tons of citrusy, sour, sweet, creamy, and tangy flavors into one bite, these Christmastime snacks are sure to delight all the senses. Better yet, you can make these in 20 minutes with minimal fuss! So make sure to add these on the menu for your next holiday party and give everyone a little bit of magic to bite into. 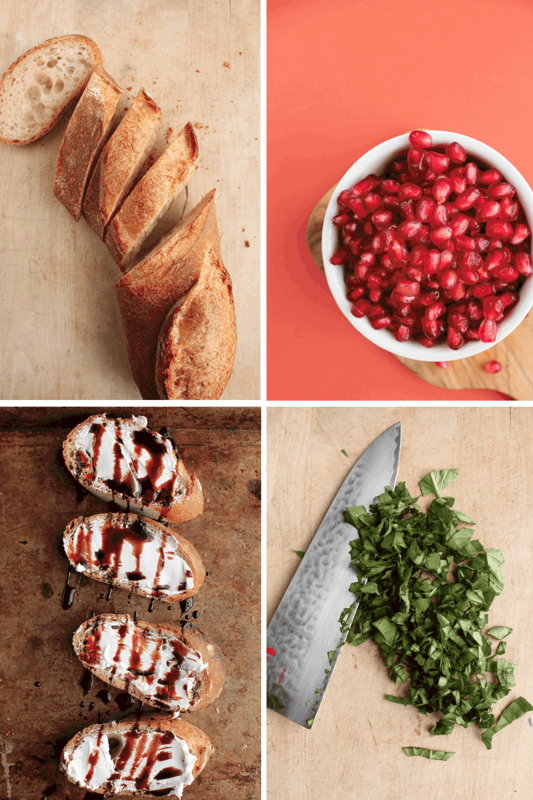 Preheat oven to 450 degrees F. Slice the baguette into 1"" slices and lay flat on a baking sheet. Bake for about 10 minutes until crispy and slightly brown around the edges. Remove from oven and let cool.